This is a great place to take children as it features a number of circus-style rides; a little roller coaster, a space needle, a chair flinger, etc. You can get tickets and more info here.All day passes are $27.00. The pier is the home of Bubba Gump’s restaurant which is mediocre for the prices. If you want seafood, we highly recommend Gaido’s on the Seawall at 38th street. Right next door to Gaido’s is Nick’s Redfish Bar. The grilled salmon is excellent and they offer a nice selection of vegetables and the shrimp cocktails are super. One of the nice things about the Pleasure Pier is that you can walk straight from the beach to the entrance. If the kids want to play and you want to hang out on the beach and read a novel, this is a good way to split up the family. The Pleasure Pier is globally unique that the rides are right on the water. It’s built on the pier that used to be under the Flagship Hotel. It was wiped out by hurricane Ike back in 2008. The menu is very diverse and there are many restaurants within walking distance. You can view the menu and restaurant list here. However, you really need to go to a cross walk at a traffic light to cross the road. There are no pedestrian tunnels under the Seawall. 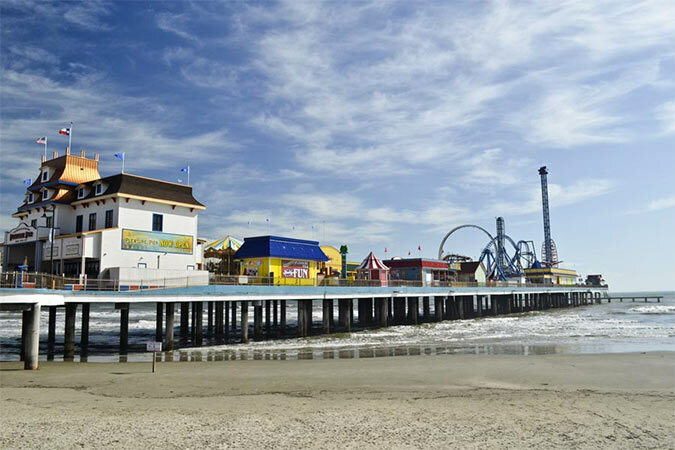 Kids of all ages that enjoy amusement parks will definitely find amusement at Galveston’s Pleasure Pier. Lastly, the Pleasure Pier is a super duper place to watch the sunset and every Sunday at 9pm there’s a free fireworks show which is quite good.